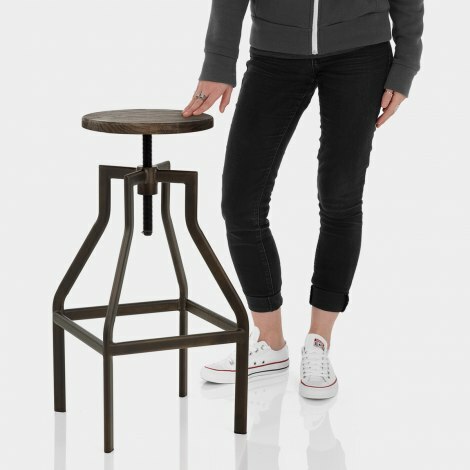 Combining a striking vintage look with classic fixed-height stability, the Vintage Revolution Stool Dark Wood is ideally suited to any space. 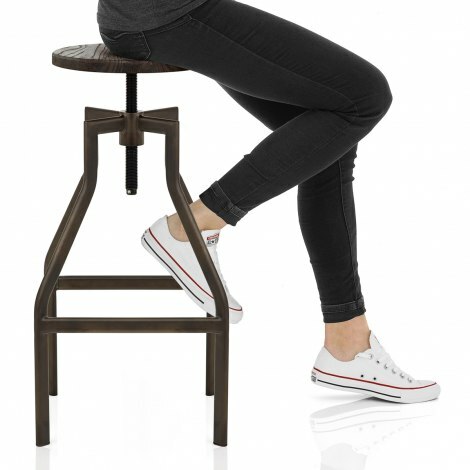 Delivering distinctive industrial style, the Vintage Revolution Stool has an aged allure that is completely timeless. A rounded seat, crafted from high quality solid dark wood, sits atop an exposed screw-thread mechanism, allowing you to adjust the height to suit your individual needs. Plus, the authentically antiqued steel frame lends this model a truly stylish aged vice. An unusual square-shaped bracing bar ensures stability, and can also be used as a supportive footrest. Finally, to help to avoid damage to your floors, protective floor plugs are also included. Great speedy service and the product to match! Looks as it is on a picture; good quality; easily assembled. Would recommend this product.